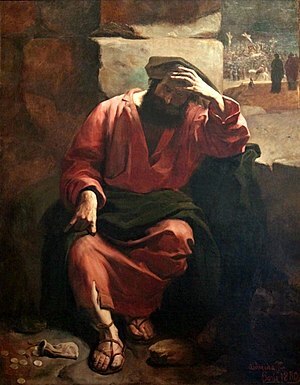 Posted on May 14, 2011, in Teaching and tagged Betrayal, Christianity, devil, House of Annas, Judas, Judas Iscariot, Lord Jesus, Price of Betrayal, Real Christianity. Bookmark the permalink. 5 Comments. How often we allow the betrayal of a trusted friend, relative or Brother to sour our relationships…not only with them, but with God as well. Some even withdraw from the fellowship of the Body. It’s like the betrayal raises a wall between us that can only be breached by the person causing the hurt…and so we wait for apologies, never expecting to receive them. We forget that to be forgiven we must forgive(Matt 6:14). Let us never forget that a betrayer can be forgiven (Peter is a prime example). If God can forgive, why not I? Very well said, Don. Thanks. In one point of view, Jesus had to suffer the cross alone. We as imperfect men and women could not have gone with Him that time. Many have had the fortitude to do so since. Jesus bought my freedom that day, I am very thankful. If a man went with Him that day, would things be different? I believe it was God’s plan all along. A gift to save us who cleave to the cross, and yes, to teach us, we can not be saved any other way.